Many people by now are familiar with NaNoWriMo, National Novel Writing Month, a challenge to write at least 50,000 words of a novel during the month of November. I’ve taken part in two NaNoWriMos along with a group of other middle grade and young adult writers in an online discussion group. In the first, I was the group caboose, dropping out after 2500 words of a dystopian novel because I hated my main character. The second time I wrote about 23,000 words, 80 pages, of the novel that became Rogue. Ordinarily, though, November is a tough month for me, and I wish the challenge took place in March — a month that’s one day longer and with fewer distractions. November marks the beginning of the holiday season and involves a lot of travel and family commitments. It also happens to be a month with a lot of conferences. In November 2013, I put 4000 miles on my car, driving to conferences in Connecticut (twice), Michigan, and Boston. This November, I have trips to Connecticut, Houston, and Minneapolis, with three separate presentations for the NCTE/ALAN (National Council of Teachers of English/Assembly on Literature for Adolescents of NCTE). This year, though, I’m changing my strategy. 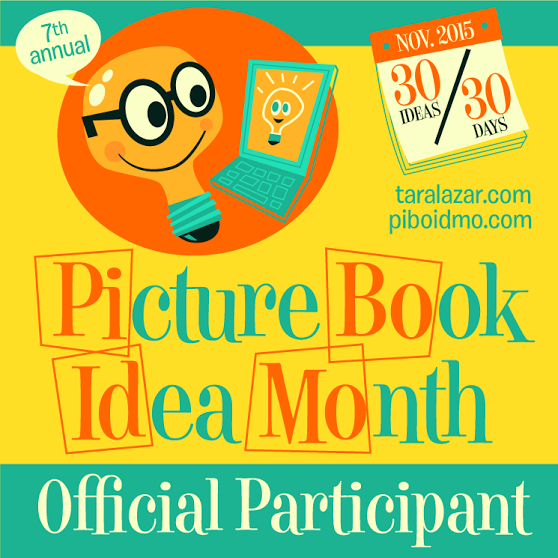 Instead of NaNoWriMo, I’m taking part in PiBoIdMo, Picture Book Idea Month. 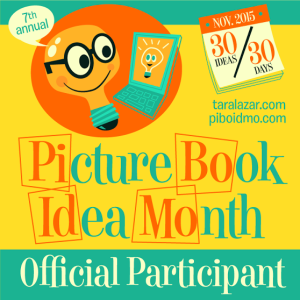 Organized seven years ago by author Tara Lazar, PiBoIdMo challenges participants to come up with 30 new picture book ideas, one for each day of the month. They don’t have to be great ideas — I expect most of mine not to be viable — but they provide the seed for more development throughout the year. As part of PiBoIdMo, successful picture book authors offer advice on generating ideas, choosing the most promising, structuring the picture book, and writing the story for the youngest readers. Those who register for the challenge by November 5 and complete it (honor system!) are eligible for a drawing with prizes that range from free books to critiques by authors, agents, and editors. So, why picture books? Nearly all of my writing up to now has been for teens and adults. 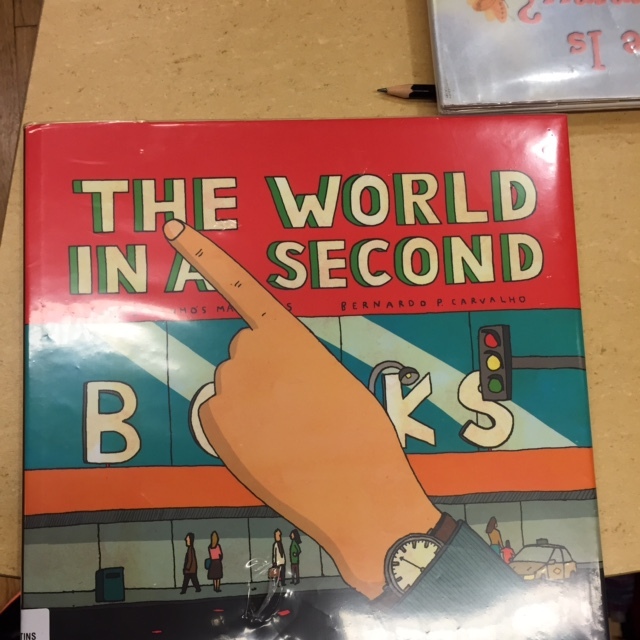 The World in a Second in the wild, at the Mulberry branch of NYPL. When I was asked to translate The World in a Second, a concept picture book that explores events that happen at the same moment around the world, I fell in love with the interplay between text and illustration, and the way the author communicated so much in a few words. Isabel Minhós Martins’s spare text inspired me to sign books with my own “world in a second” line: “…on a New York City street, a translator’s small dog barks at the big dogs.” (We’re working on that barking problem by the way.) 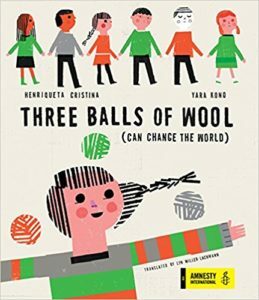 Now that I have three more picture book translations scheduled to come out in 2016 and 2017, I’m hoping that my experience will “translate” into more skill in terms of writing my own books. I feel my work with LEGO scenes on Instagram has also given me practice in conceptualizing a story visually and describing it so that every word counts. Unlike Twitter, Instagram doesn’t restrict captions or text to 140 characters, but people typically don’t read more than a couple of lines. 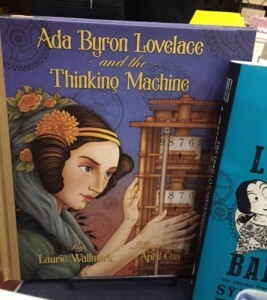 My fellow VCFA’er Laurie Wallmark’s acclaimed new picture book at Bluestockings. Laurie is one of the people giving advice for PiBoIdMo. Two weekends ago, I saw Kyra Teis, a wonderful illustrator and former SCBWI regional advisor for the upstate New York area where I used to live. When I told her I was translating picture books, she expressed surprise, because she always saw my greatest strengths as character development and inventive storylines. Her kind words made me consider giving picture books a try. In addition, my lovely editor at Running Press, Lisa Cheng, left the publisher and the YA field altogether, so my agent and I will have to find a fourth editor for a fourth book, which is tough to do even if the others have won awards and/or sold above expectations. I’m working hard on promoting Surviving Santiago, but maybe it’s time for a moratorium on publishing more YA novels (though I’m still drafting my work-in-progress) and a move in a new direction. How fabulous that you are doing Picture Book Idea Month. In fact, you’ve just inspired me to do it too! Thanks, Lyn. I hope your PiBoIdMo is going well, Sandra! The official site has such great articles too. I’ve learned so much from them.